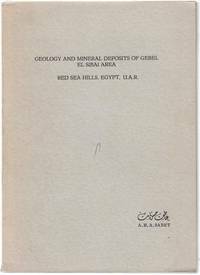 Geology And Mineral Deposits Of Gebel El Sibai Area. 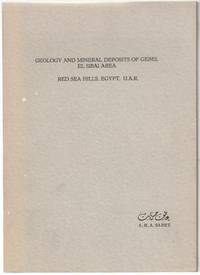 : Red Sea Hills, Egypt, U.A.R. Rijswijk, Uitgeverij Excelsior, (c.1961).. First Edition; 8vo; pp. 189; numerous b/w illsutrations throughout, summary, references, original large folding map in pocket at rear; original stiff illustrated wrapper, spine browned, pen mark to front of wrapper and spine, institution stamp to front free endpaper, a good copy. RIjswijk, Uitgeverij Excelsior, (c.1961).. First Edition; 8vo; pp. 189; numerous b/w illustrations throughout, summary, references, original large folding map in pocket at rear; original stiff illustrated wrapper, spine browned, a good copy. Of the Thunder of Hooves. : Melodie's Son; The Story of Mountain Rogue. First edition; 8vo; pp. 237; flecking to page edges, bumps to dustjacket, 5cm. fold mark to back of dustjacket, 3cm. tear and fold to back of dustjacket. (Victoria, Australian Public Relations Services Pty. Ltd., 1982). This copy inscribed and signed by the author. Noel Nocturne and other P.O.W. Poems. 8vo; pp. 26; lightly browned stiff stapled wrapper over paper. Adelaide, The HAssell Press, 1944. London, Herbert Jenkins, 1954. . First UK Edition; 8vo; pp. ix, 191; frontispiece, 9 b/w photographic plates; original cloth, chipped dustjacket, page edges flecked, a good copy. SACLIER, MR M ; Editor. 8vo; pp. 87 - 133; stiff stapled wrapper. good copy. n.p., 1972. Tasmanian Historical Research Association. Papers And Proceedings. : Contents: Leeds Merchants and Manufacturers in Local Government before 1840 by W. G. Rimmer. The Rattlesnake Revisited: Review Article by P. A. Howell. Where were the Gentlemen in Green Gigs: Review by R. S. Neale. October 1969. Volume Seventeen. No. 2. 8vo; pp. 38 - 70; stiff stapled wrapper with minor fading along spine, good copy. n.p., 1969. Tasmanian Historical Research Association. Papers And Proceedings. : Contents: Henry Melville for Example by Guy Featherstone. George Augustus Robinson: Chief Protector of Aborigines, Port Phillip 1838 - 1849 by Barry Bridges. August 1971. Volume Eighteen. No. 3. 8vo; pp. 85 - 109; notes and references; stiff stapled wrapper with minor fading along spine, good copy. n.p., 1971. The Groove Concise Dictionary of Music. (New York, W.W. Norton & Company, (1988).. First American Edition; 8vo; pp. (viii), 850; original cloth, dustjacket, a fine copy. Sydney, Thomas Richards, Government Printer, 1883. 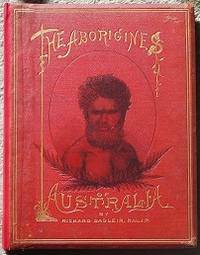 First Edition; 4to; pp.70, portrait frontispiece, 7 full page plates at rear two of which are colour; original red cloth, re-backed with new endpapers, title and decoration on front board, classic aboriginal bust in black to front cloth; foxing to plates at rear and verso frontispiece; bumping to corners of boards, minor marking to cloth; otherwise a good, tight copy. Along The Length. 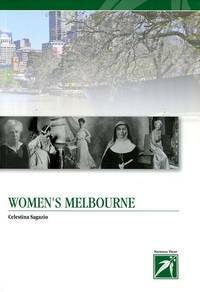 : An Account of Living and Working on the Maroondah Aqueduct. 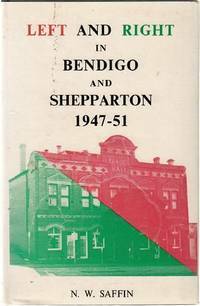 Victoria, Yarra Glen & District Historical Society, c.2003. . First Edition; 8vo; pp. iii, 34; 4 colour maps, numerous photographic plates, references; original spiral bound illustrated wrapper, minor marks to back, otherwise a very good copy. 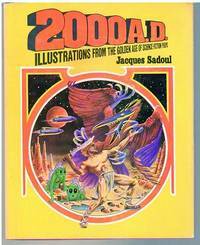 2000 A.D.: Illustrations From the Golden Age of Science Fiction Pulps. (London), Souvenir Press, (1975).. Lge. 4to; pp. 176; frontispiece, profusely illustrated with b/w diagrams throughout, orginal cloth, chipped and faded dustjacket, otherwise a very good copy. The Cord Front-Drive. : The Intriguing Story Of A Fabulous Automobile. Los Angeles, Floyd Clymer Publications, 1957.. 8vo; pp. 224; numerous b/w illustrations; stiff illustrated wrapper, spine and corners bumped, good copy. Kilmore, Lowden, 1974. . First Edition; 8vo; pp. viii, 94; four pages b/w plates; appendices, index; original green cloth, title in gilt on spine; dustjacket; a very good copy. Kilmore, Lowden Publishing Co., 1974. . 8vo; pp. viii, 95; four pages b/w plates, appendices, index; original green cloth, mark to rubbed dustjacket; minor browning to pages; otherwise a very good copy. 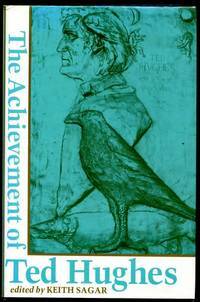 The Achievement of Ted Hughes. 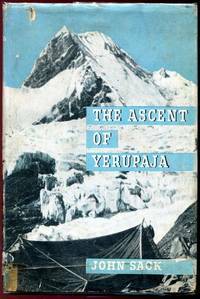 (Manchester), Manchester University Press, (1983).. First Edition; Med. 8vo; pp. [vi], 377; notes, index of works by Ted Hughes, original cloth, title stamped in gold on spine, minor marks to dustjacket, otherwise a very good copy. Ted Hughes. 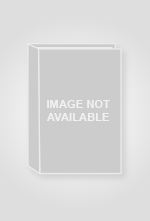 : A bibliography 1946-1980. (London), Mansell Publishing Limited, (1983).. First Edition; 8vo; portrait frontispiece; index; original cloth, dustjacket, a very good copy. East Melbourne, National Trust, 2010.. 8vo; pp. vi, 96; numerous colour illustrations; acknowledgements, bibliography, notes; stiff illustrated wrapper; a fine copy. SAGGERSON, E. P; General Coordinator. Printed by Mouton N. V. The Netherlands.. 119 x 85.5 cm. colour geological map, legend; some wear to edges of sheets, minor marks to back of map, minor tears to bottom of map; otherwise a very good copy. In French and English. The Battle of Chess Ideas. First Edition; 8vo; pp. 160; diagrams, bibliography, opening index, general index, games and positions index; original cloth, dustjacket, a good copy. London, Batsford, 1972. Ink markings to pages 122 & 123 and to back of dustwrapper.